Stop looking – list with Sue! We would have no hesitation in recommend Sue and have already done so to several friends. Sue is exceptionally professional to deal with. She advised us on how to best market our property and managed our expectations well. She certainly knows the market and will give you constructive advice rather than just being agreeable to get a listing. Sue is a skilled communicator who took ownership of the entire process. Sue demonstrated a genuine interest in us as clients and was extremely proactive in keeping us informed through each step. Her commitment to qualifying potential buyers ensured we were not left wasting time with tyre kickers. Sue was an absolute delight to work with and sold our home to a beautiful young family. We could not recommend her more highly! The most helpful and under standing person, great personal repour with lots and lots of patience. Thanks Sue for all your time. 24 July 2018 Sue recently sold our first home for us after only having it listed for 2 days. Sue was such an amazing help from start to finish explaining everything we needed to know and do, assisting with paperwork and great advice in setting our home up for photos. Because of her great communication throughout the whole process and complete honesty our sale went as smoothly as possible and we couldn’t be happier. From the outset Sue was enthusiastic, encouraging, professional and provided valuable information as to how we should present our home for sale. The photos in relation to the advertising campaign were fantastic and we believe were attributed to Sue’s accepting nothing but the best from the photographer. Sue handled the difficult issues related to the sale in her stride and showed great negotiating skills. We would happily use R&W / Sue Dewar again and highly recommend her. I met Sue Dewar at an open house, and was so impressed with the way she conducted herself. Within a week I invited her to my property to do an appraisal for selling, she was the fourth agent I’d had here, and by far the best, and most professional. Sue sold my property in 31 days, she made the whole process so easy, she went above and beyond to help me, and I would highly recommend her to anyone thinking of buying or selling a property. She’s an asset to Richardson & Wrench. 20 July 2018 Sue was so helpful and attentive throughout our recent purchase, she went above and beyond and we can’t thank her enough. 25 June 2018 Sue was a great agent for us, very good at communicating and trying to assist your every need. Thanks sue! Perfect agent to deal with! 25 June 2018 Sue is beyond amazing at her job. 1 day on the market and our house was sold. She was upfront and honest with us to start with and followed what she suggested and got the outcome that she is expected. We wouldn’t do business anywhere else and have highly reccomend her to everyone we know. Very professional service. 24 June 2018 Hi, well what can I say. Sue was awesome from the start to finish. Not only was she fantastic to deal with but she had our house sold before it was even advertised! Selling our house was a fantastic experience all thanks to Sue. I d highly recommend Sue to anyone. 17 June 2018 It was a quick sale but Sue was very knowledgeable and helpful. 13 June 2018 Sue was fantastic. Such good advice and market knowledge. She kept everything moving when the market went quiet. She and the team at R&W, Caboolture, went beyond what was needed to be done to get a contract on our home. She continually thought ‘outside the box’ with our marketing campaigns. We thoroughly recommend Sue and the team at R&W at Caboolture to handle the sale and purchase of your new home. From the moment we engaged Sue as our agent she made us feel completely confident and at ease with the whole process of selling our home. Sue’s knowledge and expertise was amazing – she was very thorough and got things moving really quickly. We were always kept fully informed throughout the entire process. Sue knew the market and picked the price point perfectly; marketed the property beautifully and got our sale in less than a week. We wouldn’t hesitate to recommend Sue as we couldn’t be happier with the service she gave and especially her results. Sue was very patient and very helpful with all our questions. Nothing was a problem and Sue was extremely courteous and professional at all times. Sue went above and beyond to achieve a great outcome. She was honest and direct and knows the product she is selling…kept us up to speed all the time on what interest our property was attracting. Couldn’t fault the service we were given and would highly recommend sue. We highly recommend using Sue as you real estate agent. She was there every step of the way through our sale and could be easily contacted at any time. She was also a big help in the negotiations with the buyer. A stress free and smooth sale. Thanks again Sue! From the first phone call to SUE, to the sale of our property was 7 days. Thank you SUE for your positive attitude and understanding of our situation in the selling of our home. Your knowledge, communication and experience in selling our home was exceptional. We would highly recommend SUE. Sue made the whole process of buying our new home so smooth!!! She made herself available at times that suited us best, organising the sale on a Sunday and signing the contract at night, and always with a smile…. even when we were late arriving home and found Sue sitting waiting patiently out the front!!! Sue responded promptly to any questions we had and followed up with the sellers immediately when there was an issue with building finals. This whole experience has been so positive because of Sue. Thanks Sue so much for your professionalism, friendliness and honesty. Happiest Agent you will ever meet! Sue sold our home on the very first day she listed it! Sue achieved the purchase price we were after, and best of all, Sue sold our home to a really lovely couple who fell in love with our house and would love it as much as we did. If only there were more than 5 stars to award the lovely Sue Dewar! Sue has a wonderfully happy and friendly personality. From the moment you meet Sue, you just know that she genuinely cares. Sue is in constant contact with both the buyer and the seller and keeps everyone in the loop with every detail. Sue phones and emails the buyer and seller frequently. Sue answers your calls, and if she does miss a call because she’s with a client, she calls you back in a very short time frame, or even sends you a quick text to let you know she’ll be with you soon. Sue is the kind of lady who is lovely to be around, she is happy, energetic, passionate, easy to get along with, and genuinely cares. I felt completely confident with Sue. Even better, I knew that she would inspire this same confidence in buyers for my house. Confidence is a very important element when selling your home. It takes the stress away and gives you hope that the transaction will be easy and fair. Sue provided confidence to us and to our buyers so that it was simple and worry-free for everyone. Thank you Sue, I award you 100 stars! Sue made the process of buying a property very easy and kept us informed and updated during the entire process. It was great dealing with an honest and knowledgeable agent. Sue has excellent communication skills and kept us fully informed every step of the way during an extended and difficult contract period. She was able to keep all the negotiations on track whilst juggling four sales/purchases and always with a smile. I would definitely use Sue as my agent again and I constantly recommend her to friends knowing that she will do an excellent job every time. Sue is HIGHLY RECOMMENDED! Impeccable communication! Reliable! Professional! Knowledgeable!!! It is with great pleasure that I write this review. Michael & I both HIGHLY RECOMMEND Sue. From our very first communication, Sue has been fantastic to deal through. The communication has always been impeccable. She has always gone above and beyond to keep Michael and I informed of every step in our sale. She is approachable, reliable and very professional. We were selling a prestige property with a prestige price tag and within 4 days of our property being listed on realestate.com.au, Sue had not 1, but 2 offers for us on the same afternoon. Two offers well above our expectations. Sue was absolutely fantastic to deal with. The service we received from Sue was absolutely flawless. She assisted us through the sale of our home and the purchase of our new property with ease with both properties settling at the same time. Highly recommend Sue to anyone who is seeking a professional and genuine real estate agent. Thank you Sue for making this process smooth and stress free. This is not the 1st property Sue has sold for us and I am sure it won’t be the last, Sue gives us good advice when needed and just does that extra work to see the sale is done and completed. Once again Sue thank you for your support. Looking for an agent who will work hard for you? Then Sue is your agent! Great communication skills, with a down to earth, no nonsense manner. Very supportive during every stage of the process. Thanks Sue! And all the R & W Team. Did above and beyond what was required. Always available and returned calls promptly. Always kept us in the loop and got the price we wanted. Sue was recommended to me by my new neighbours who had just bought across the road. From the very beginning I could tell Sue was honest and caring. In the first week we had a contract on the house thanks to Sue but unfortunately the buyers couldn’t get the finance. The house was on the market for 4 months which considering it was such a small house to sell was a reasonable timeframe. Now sold. Throughout the whole process Sue kept me up to date, she kept the potential buyers viewing the property and never gave up. She is a very professional lady who goes above and beyond which she has had to do several times with me and I wouldn’t hesitate to recommend her to anyone selling or buying. We had the pleasure of meeting Sue to discuss putting our homes on the market, & purchasing a home that suited our requirements. Sue found us the perfect home & our home sold asap, nothing was ever a problem. This lady is a huge asset to your company. I would highly recommend Sue at R&W. Sue Dewar. She was always available if I had any questions and got back to me extremely quickly. She was very professional and had great negotiation skills. Thank you Sue for all your help with our first home purchase. Sue has been consistent, supportive and reliable through our current purchase and also our previous purchase. Thanks Sue and we look forward our next venture with you in future times. I recently purchased a property via Sue Dewar Richardson &Wrench in Caboolture/Morayfield. Buying a property can be very stressful time, however Sue and her team made the whole experience exciting and stress free!!! Sue was very knowledgeable about the area and provided open and honest information I required to make an informed decision regarding the purchase of a new home. I would highly recommend Sue for those seeking to purchase property. Thanks again Sue!! Sue was very helpful and things went very smoothly through the negotiations and organising appointments. Highly recommend sue as an agent. Sue demonstrated great interest in our situation at all times. Her knowledge of all aspects regarding the sale of our house was rewarded with buyer being found within three days of listing. Sue has followed through from that time keeping us informed of progress until final settlement. We would recommend Sue to any person seeking a real estate agent. Sue was a pleasure to work with nothing was too much trouble and it was a pleasurable experience for us. Will definitely recommended Sue to our friends. Recently I had to sell my home and find somewhere to go. 1st came the appraisal. I was given a very detailed document with helpful hints on how to sell, and comparisons of the market. Sue also guided me in how to present the house. Her TEAM were introduced to me and shown the house. 2nd Professional Photos: best adverts!! 3rd presenting to prospective buyers, with “open house”. I was kept up to date with all proceedings. 4th SALE! Each step information was positively given. My fears were eased. Then came the search for my new place. Sue took me to see many places, some nice but! and others to see what I Didn’t want. Next excursion of the available properties, YAHOO! This lovely place came ready and Sue did a great job of negotiation. and there was only a few weeks between sale and Buying my own home. I was given a gift for both deals, and have had follow-up to ensure I’m happy and satisfied with all of Sue’s hard work. Sue was great never gave up finding the right buyer. Very thorough through the whole sale process crossing the t’s and dotting the i’s as she says. Would definitely use and recommend sue again. We found our perfect house in Caboolture with the help of a very friendly lady at Richardson and Wrench – Sue Dewar. After months of liaising with Sue via email and phone we finally met to be shown some quality homes. Thank you Sue for helping us into our forever home. Being the first home i had sold i was a bit unsure of what to expect and how the whole process worked. I then contacted Sue Dewar and after speaking with her felt instantly reassured and comfortable that she would handle the sale expertly. She was very knowledgeable with the current market area and how we should best advertise the property and achieved an exceptional result within a week because of it. I would highly recommend Sue for anyone. Sue is a great agent with fantastic knowledge of the property market. A highly recommended agent whom I would recommend to anyone needing real estate service. Has been helpful and continues to contact via telephone and email for exceptional service. Sue is a Friendly, warm agent her knowledge and help in assistance in buying Dollarbird was higher than we could have imagined she guided us and was always there on the phone to help. I recommend her to any customer buying a home ask for Sue. Thankyou Sue. Sue has been an absolute star throughout the sale of our house. Kept us informed through the entire process and showed great support when needed. A1 recommendation. It was a difficult property to sell but Sue was able to push through all odds and achieve a successful sale with minimal complications. She was always professional and informative. We highly recommend her, a true down to earth honest agent. After the first agent from a different company did nothing in 8 weeks, we signed up with Sue and our house sold on day 3. what more could you ask for. Thank you Sue. Sue is honest and goes the extra yards for her clients. Nothing is too much trouble. Sue is pleasant and helpful and takes your needs on board. Thank you Sue for all your help and understanding. 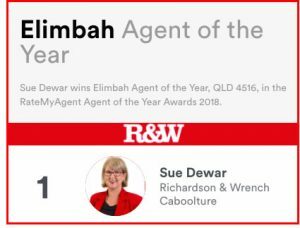 Sue I am forever thankful to yourself and RW – Caboolture. Due to the tragic circumstances, I walked around in circles not knowing what to do or where to start for that matter. We just happened to meet, connect and I knew after speaking to many other real estate agents, you had my interest at heart. We lived in NSW so distance was a big issue, you drove around checking on the property continually, making sure all was ok and my mind was at ease. You listened, you delivered and you generally cared. We shed a few tears together and you held me up at times when I thought I could no longer stand during the process of not only losing my family but sadly having to sell the home as well. You will always hold a special place in my heart, and to this day I talk about you and your professionalism amongst friends/family all the time. Thank you, never stop being you. My wife and I purchased a house through Sue in April this year. Sue’s communication was excellent and nothing was ever too much trouble. We found Sue to be very diligent and reliable and would definitely recommend her should a similar situation arise again. We felt very comfortable with Sue knowing she had our best interests in mind. My husband and I first met Sue when we purchased our current home in December 2015. Sadly, through tragic personal circumstances, I found myself selling again much sooner than expected. When this occurred, I did not hesitate to contact Sue, who I felt instantly comfortable with, from our previous meeting. Sue is warm, friendly, trustworthy, reliable, honest and is a great communicator. I certainly have no hesitation in recommending Sue if you are thinking of selling or buying a property. When one reaches much more than 4 score and 10 (77) we tend to have negative thoughts about car sales personal, insurance scams and the like and I must say this was part of the way I felt about Real Estate Agent Representatives of all levels. This attitude I held up to the day after I checked out, questioned and asked friends and family for their direction to sell my home to move into a Retirement Home therefore finally deciding to list with the absolute standout Agent, That wonderful, kindly, decent, lovely, impressively efficient and truthful Sue Dewar. That day never to be forgotten as I had be warned and had impressed upon my mind by all my friends Home selling experiences that I had to be prepared for a long wait and final disappointment in and with the selling experience. All out the window in one Day! Yes 1 day ! Sue went through the onerous paperwork, answering all my difficult questions and putting my doubting and suspicious mind to rest for , finally signing the listing documents at 10 AM, Sue left me with final words about our business agreement that She was going to sell my home as swiftly as possible and see that it will be a pretty painless exercise to me but easy for her. Big words for this petite girl/lady but at 4 PM that very same day, Sue called and said she had an offer. I declined even though it was slightly more than the minimum I would happily accept, I refused. Within an hour, at 5 PM, Sue called with a much higher offer to which I accepted. I have no need to bore anyone for the rest of the process was as easy and Sue assisted me through to the settlement as efficiently as she promised. The very least I can say about this SuperWoman is you would have to be a Blind Freddy and as dumb as a brick not to list with full confidence with this beautiful, sweet and beautiful gentlewoman who has outstanding business touch and skills. We couldn’t be happier with the way Sue conducted the entire process of selling our house. She was always cheerful, courteous, helpful and friendly. I would gladly recommend her to our friends and anyone who was thinking of selling. Sue was very helpful and supportive during the entire purchase process. Easy to deal with and very responsive. Sue was engaged to sell our property after achieving a quick Sale in same Street. Sue did the same for us, achieving a Signed Contract after only the 1st Open Home! Sue’s lovely and trustworthy persona, ‘can do’ attitude and problem solving skills ensured a stress free countdown to Settlement. I very strongly recommend Sue! Thank you Sue for your professionalism. You are honest, hard working and always looked after our best interest. Would happily recommend you to anyone. We recently listed our home for sale with Sue whom we found to be very professional, kept us fully informed during the marketing process [and] was always available to answer any queries we had. I would have no hesitation in recommending Sue to anyone trying to sell their house, we sold our acreage property in just four weeks the whole process went without a hitch. Sue was very professional and so easy to deal when we purchased our home at Banksia Beach. We were kept informed during the entire process and any queries we had were answered honestly and promptly. We would highly recommend Sue and would use her again if we ever move. Sue loves what she does and this reflects in her results. Her knowledge, enthusiasm, attention to detail and follow-up sets her in an elite category of high performing agents. She was knowledgeable in assessing our property and making recommendations to maximise the price. She was skilled in finding the right buyer, negotiating a cracker price and holding the deal together to settlement. She has the professional women’s touch in spades and a good sense of humour and I would highly recommend Sue Dewar if you are thinking of selling in the local area. After finding our dream home, Sue Dewar sold our house with no stress and throughout the process Sue kept us in the loop at all times. I definitely recommend Sue to everyone I know. If u r thinking of selling contact Sue for advise. If u r looking at buying Sue will help u find the property. We approached Sue specifically as she had recently sold a neighbouring property similar to ours quite quickly. After my first meeting with her, I didn’t even bother shopping further for appraisals. The feels were there immediately. Her market knowledge was spot on. Her enthusiasm and excitement about our property was genuine and we sold it right in the bracket that she initially indicated. Everything went smoothly and we were happy with every step she took. It wasn’t uncommon for inspections or open houses to go for near on an hour. This lady puts in the time to showcase your property to its fullest and does not rush anyone in and out your door. Make sure she is the first agent you meet with and I can guarantee you won’t bother looking elsewhere. Highly recommended. Sue was always in contact with us every step of the way and was brilliant in guiding us as it was our first time selling, she knew her stuff and would gladly recommend this lovely lady. We found Sue a pleasure to deal with, she is friendly, honest and understands the housing market and the area. Sue is very focused on selling properties and also assisting the buyers, she works with you to gain the best outcome, even paying for our ad to come up first on one of the search engines, Sue is very approachable, she communicates well and updates after open homes so you know the number of viewings / buyers that have come through the door. Sue follows up with the buyers and updates regularly on the feedback. we cant thank Sue enough for selling our home and would recommend her highly to any future sellers or buyers, Sue’s Honesty and friendliness sets her apart from the rest of the real estate agents, we would look at Sue as being a friend now and would love to keep in touch, Thank you Sue !! Sue was so marvelous selling our home. The process was very seamless and Sue made it fun with her positive and endless energy. Sue was great at keeping us up to date along the way and sold the house within days for the price we wanted! A big thank you to Sue for going the extra mile when I was buying this house. The level of communication has been outstanding and no request has been too much trouble. She has invaluable local knowledge and advice as well as a high degree of professionalism and integrity. Her attention to detail has been extremely impressive. Sue has also been most helpful in providing ongoing advice and support since buying the house that is above and beyond that which would normally be expected or provided by an estate agent. THAT ‘S DEDICATION!!!!!!!! Thanks, Sue. After having our house on the market with another agent for nearly a year, Sue came in and just took charge. She gave us advice on what we needed to do to prepare the house for sale. We had to make some difficult decisions and Sue’s advice helped us make the right ones. 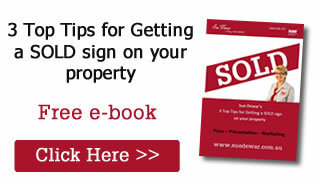 Sue kept us informed all the way and shared the highs and lows that go with selling a property. It was such a pleasure working with Sue. She has extensive knowledge of the local area and the property market. Thank you Sue for helping us move onto the next chapter of our lives. We helped my Mum purchase this house after my Dad passed away. Right from my first phone call to Sue about open house we felt really comfortable with her. Upon meeting her at the open house we found Sue to be friendly, honest and not at all pushy about trying to sell the house to us. We had a really good feeling about her. She went above and beyond in helping us through the process. Even now, nearly 3 months down the check she checks in with us to see how we are doing. My Mum is absolutely thrilled with the house and how the purchase went. We are also thrilled because it’s wonderful to see my Mum so happy. Thank you Sue, you’re not just a salesperson, you’re an amazing person and we would highly recommend you to anyone looking to buy a house. Sue sold our investment property and throughout the process, she was very personable and professional. I fully recommend Sue Dewar for your real estate needs and would use her service in the future. I would not hesitate in recommending Sue to prospective buyers or sellers. Sue helped me with my presentation and advised me of my options regarding price. Her knowledge of the market in my area helped me with my decisions. Sue has a great personality and is a dedicated agent. Sue Dewar helped us sell our investment property within 3 weeks. Had a number of helpful suggestions, worked around tenant’s lives in a considerate manner (which was very important to us), to achieve a favorable outcome! Am very happy. Would recommend Sue highly! My girlfriend and I decided to purchase our first home. Sue walked us through many properties, gave us high-quality advice and guided us perfectly through the whole process. Definitely will be going back when we go to purchase again. Well, what can you say about the best? Sue, came highly recommended to us and for a good reason, she did what she said she would. We had to wait for it but we got a good price for our area and type of house but she said to get the higher price we had to do this and all worked out well. Sue, is a lovely person and will be there when you have any doubts about how it is going and will suggest sensible ways to present your house to sell. Always given updates and regular activity on the net so you know how buyers are responding to the marketing and she is delightful in conversation that supports you at a stressful time. We have no hesitation in recommending Sue as your agent. Very pleased with Sue Dewar being our agent to sell our home. Sue explained in easy to understand terms how our house would be marketed to sell. If we needed to ring Sue, she was more than happy to answer any questions we had and if Sue was unavailable at the time she was very prompt in getting back to us. Sue certainly made us feel that selling our house was her #1 priority. Sue is a brilliant agent with a wealth of knowledge and we are very lucky to have had her as our agent. She had an offer on our house within hours! I can’t recommend her enough. My Husband and I have both bought and sold property with Sue over the past 2 years and we could not rate her highly enough! She is very thorough, personable and nothing is too hard. She kept us up to date every step of the way and could not have been any more helpful. We would not hesitate to buy or sell with Sue again in the future. Sue helped me find a great home. She understood what I wanted and only showed me appropriate properties that were in my market. She was friendly and very helpful. I would recommend her to anyone and will be using Sue in any future property ventures. Exceptional service and results. From first contact, Sue was not only efficient but went the “extra mile”. Exceptional communication and negotiating skills ensured that all involved were fully informed throughout the process and a great outcome in minimal time was achieved. Thanks Sue. Thank you Sue! I just wanted to say a huge thank you for selling our house Sue. You made it so easy with your advice and a quick turnaround, you are amazing! It’s so nice to know that there are still people out there who know what they are doing and are just genuinely nice people to deal with. I’ve already started recommending you to anyone I know who may be thinking of selling in the future and we will definitely be contacting you when we decide to buy/sell again. After vetting a number of local real estate agents I recently engaged Sue to sell my rental property. Her service was exceptional providing regular feedback and keeping me in the loop. She was patient and understanding to the needs of the tenants within the dwelling and provided sound advice to me and them making the transition for all involved a seamless process. The dwelling sold quicker than expected without compromising on the price. Sue’s skill in sales is evident, If the opportunity presented again I wouldn’t hesitate in using or recommending her service. I was swayed to sign Sue as my agent because of her genuine interest and willingness to take my point of view seriously and accommodate my requests re open houses and advertising. Sue was honest and enthusiastic about my home; I trusted her and the feedback I got. She was true to her word and kept in contact after each open house. Sue went out of her way to accommodate an interstate buyer, which I believe went along way to securing a quick and seamless sale. My husband and I sold our house in 5 days with Sue Dewar (Richardson & Wrench Caboolture), I would like to say she was always very friendly and gave us very good advise. She was also very helpful and would go out of her way to answer any questions asked regarding our sale. Sue was absolutely marvelous in selling my home at Jennifer Court – Sue was in contact all the time and actually cared about the listing. Nothing was ever to much trouble and found the communication with Sue highly professional thru out the complete process. I would have no hesitation in recommending Sue Dewar to any client that was interested in selling or purchasing their home. Sue has sold both my houses the first one in 5 days and the second one in 8 days which is a wonderful effort.sue takes such pride in her work and puts everything she can into selling the houses. She communicates really well with the client’s and that goes a long way in obtaining properties to sell . Sue has become a dear friend and I will be recommending her to friends and family. We were very pleased with the service & commitment provided by Sue Dewar during the recent sale of our property. Her dedication & attention to detail was second to none & we have no hesitation in recommending her. Sue made a trying time so much easier to cope with due to her knowledge of the industry & her willingness to go above & beyond helped greatly. Thank you Sue. Sue Dewar did an outstanding job of selling our property. She spent time with us prior to listing to advise on refurbishment options. Then, she managed the listing, negotiations and contract conditions with sensitivity and thoroughness. As a result, all went smoothly until settlement. A highly professional and recommended real estate agent. Thank you Sue, hope to do business with you again! I have only the highest praise for Sue Dewar. Her enthusiasm and dedication are amazing and the whole process of selling my property was a joy, it was great to work with Sue. She looked after my interests and responded to my requests and feedback with energy and the helpfulness of a friend. Way to go, Sue…. Great, great, great! This was the first time we have sold a house and we had first hand experience from recent sales from both my husbands and my parents about how very stressful it can be. We cannot express the ease that Sue put us into after speaking with her the very first time on the phone. We live remotely, approx. 1200km away from the house we were selling and we were beyond pleased with the personal service and follow through at all stages that Sue offered us. Not only contact via the phone, but also text message and facebook contact (which helped me enormously as I am a shift worker and calls are not always possible). Sue was very approachable and professional, not to mention friendly and fast – just what you are looking for when wanting to put your house on the market. Our home went for just one open house before we had an offer and contract – all within 3 days. Her flexibility, honesty and dedication has convinced me she surely is super human. Her love for her job has me envious and I would not hesitate to sell with her again (and when we are in the market again for an agent to buy we will be calling Sue before anyone else). We would like to thank and congratulate you on an exceptional job of selling our home. We had found our next dream home and needed to sell quickly to afford the transition, so the clock was against us to say the least. Our home was in a higher price range and we were unsure it if was at all achievable, but you gave us great confidence in obtaining the sale we needed, as quickly as possible. Your communication on the progress of our campaign and feedback of open homes was always promptly provided. You have a lovely personality when dealing with people and your natural ability to point our features of the property is key to your success and high professionalism. You are an achiever in many strengths and levels and again thank you for helping us achieve our dream. This is a big thankyou from Des, Carolyn, Christine and Christina for marketing and selling our mothers house. Your honesty and compassion during a difficult time for our family was special, and your expert knowledge and advice on the market was spot on. We really appreciated the fact that you went out of your way, whilst on holidays to make the sale possible. Your communication was second to none, from the time we listed mum’s house to the settlement of the home. Thanks Sue, we feel we have made a friend who will always be welcome. A flyer showcasing your sales was included in the monthly rental statement mail out, from Richardson & Wrench Caboolture office, several months ago. It caught my attention, and prompted me to call you to get a sense of the Caboolture Real Estate market. I live in Canada but as I was planning a brief trip to Queensland, so I decided to put the house on the market. You were very approachable and happy to work via email, fax and phone and kept me informed of progress every step of the way. The house was listed and you had someone interested before we even met. Thanks Sue, you are very professional, friendly and easy to communicate with, and I really liked, that you presented the facts but left the decisions up to me.